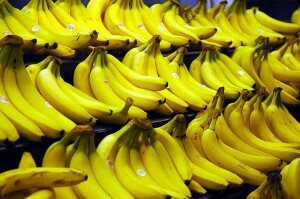 Two weeks ago (March 19, 2010), scientists from the University of Michigan published a study about an ingredient known as BanLec which is derived from bananas and acts as a potent inhibitor of the HIV virus. What stands out about BanLec is that it is a cheaper form of therapy that may provide a wider range of protection when compared to current anti-retrovirals which are commonly synthetic and made ineffective after small mutations to the virus. The cost and effectiveness of BanLec make it a promising candidate for the future prevention of HIV and AIDS, giving it the potential to save millions of lives. BanLec is a type of lectin found in bananas that can identify foreign invaders such as a virus and attach to it. A lectin is a naturally occurring chemical in plants that is of great interest to scientists because of its ability to halt the chain of reaction that leads to a variety of infections. The researchers in this study discovered that BanLec inhibits HIV infection by binding to the virus’s protein envelope, therefore blocking it from entering the body. According to Michael D. Swanson, the lead author of the study, “The problem with some HIV drugs is that the virus can mutate and become resistant, but that is much harder to do in the presence of lectins.” He goes on to explain that the lectins work by binding to sugars found all over the envelope of the HIV virus, and because of this the virus would have to go through multiple mutations for the lectin to stop working. This makes drugs such as BanLec more effective than some current anti-retrovirals which could become ineffective after one mutation to the virus. So far all tests have been conducted in the laboratory, but Swanson is currently working on making BanLec suitable for human patients. Its clinical use is still considered to be far away but researchers believe it could ultimately be used as a self applied microbicide for the prevention of HIV infection. While BanLec is no cure to AIDS, the information gained from this study is very exciting because according to researchers, millions of lives could be saved over the course of a few years with just a moderately successful treatment. 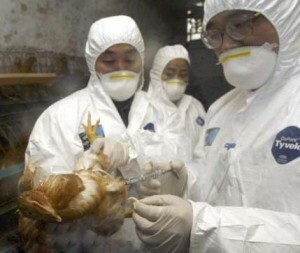 Bird flu: A Thing of the Past? This past Friday (February 26, 2010) a group of scientists led by a virologist from the University of Wisconsin published a study about a new antiviral, which was found to be highly effective against the pathogenic H5N1 avian influenza virus. What stands out about this new antiviral, known as CS-8958, is that it has been proven to be effective against Tamiflu resistant strains of H5N1. This makes it a promising candidate for the future treatment and prevention of the bird flu. Antiviral drugs are used in the treatment of viral infections by inhibiting the development of disease causing pathogens, and are a vital component in the countermeasure against human influenza viruses. Recently many new strains have been emerging, which show resistance to Tamiflu, an antiviral that slows the spread of the influenza virus within the body. These resistant strains pose a threat and make the development of new antivirals a pressing issue. Professor Yoshihiro Kawaoka from the University of Wisconsin and his team of scientists tested a drug created from a novel neuraminidase inhibitor on mice in order to see its effectiveness against H5N1 strains of influenza. Neuraminidase inhibitors are a class of antiviral drugs that specifically target the influenza virus by blocking one of its proteins, therefore preventing its replication within the body. They began their tests by giving a single dose of the CS-8958 antiviral drug nasally to mice, two hours after infection with the H5N1 influenza virus. The results showed that the survival rates were higher in the mice given this new drug when compared to mice given a standard five day treatment with Tamiflu. In another experiment, CS-8958 was found to be effective against highly pathogenic and Tamiflu resistant strains of H5N1, while it was also shown to protect mice against lethal H5N1 infection when it was administered seven days before infection with the virus. With the information gained from this study, future treatment and prevention of H5N1 with this CS-8958 antiviral could be the most effective treatment to date due to its ability to eliminate newly emerging drug resistant strains in only one dose. While future studies still need to be conducted to make sure that these results are the same when tested on humans, the potential of this new antiviral is promising and could possibly put an end to the fear of the bird flu pandemic.